This polish is so similar to the polish I wore nearly my entire senior year. I can't remember the brand or the name of the color, but when I put this on the first time I was all ERMAGHERD!!! 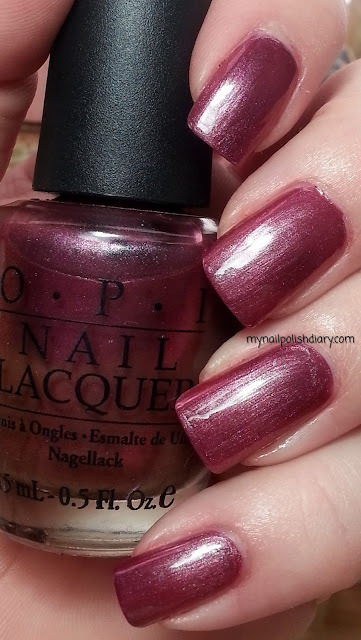 OPI My Big Break is from the 2007 Holiday in Hollywood collection. When I saw swatches of this I knew I had to have it if for no other reason than the memory of my high school love affair with that polish I cannot remember the name of. It's purpley pink rose like color with silver shimmery and a slightly duochrome finish. Application was wonderful and the wear time is amazing. I wore this for days and days all caught up in the nostalgia. *sigh* Man, I loved that polish. And this is really just as pretty and holds the memories of my senior year. Winning!